For old time’s sake, I was browsing through some of our oldest posts and I came across this post about beautiful glittered initial ornaments. I loved this sweet ornament and the memories it brought back. When La La was in preschool, we made jingle bell bracelets for all for all of the girls in her class. There were only a few boys in her class, and while we could have given them jingle bell bracelets, I don’t think they would have been a big fan. I would have been a little worried if they were into the way it looked, but they did have a pretty jingle to them. Wasn’t she the cutest? She loved to make things, too and she would actually wear the things I made her like this tunic. I still love that fabric. You know I love some beautiful fabric, too! These were the years where she kept a few specks of glitter on her scalp at all times. I’m grateful that her teachers knew we were crafty or they may have wondered why that child kept coming to school with glitter all over her! Wooden letter. You can find them everywhere, but here is an example from wooden letter similar to what I used. The main thing is to have a wooden ornament thick enough for the hardware. Screw eye. You can find these at your local hardware store or order them online. Paint Brush, any small craft brush will do. Step one. Paint your wooden letter with the acrylic paint. You don’t have to use red… they would be gorgeous in any color! Let dry completely. Step Two. Flip the letter over so that you are seeing the backside, Paint on glitter glue. Add glitter making sure to fill in the entire letter. The more the better here folks. Let dry. Step Three. Turn the letter over and repeat with the glue and glitter. Step Four. Find the best place for your letter to add the screw eye. Each letter is different, so imagine it hanging on a Christmas tree. Where would it need to be placed for it to hang the most naturally. I can usually just twist it in my hand. If you are having trouble you can use an ice pick or a drill to start your hole. Step Five. Spray the back side with the acrylic sealer, let dry and then spray the front. This should help the litter from going everywhere. Step Six: Thread the decorative ribbon through the screw eye and tie it off. That is it! There you have it! 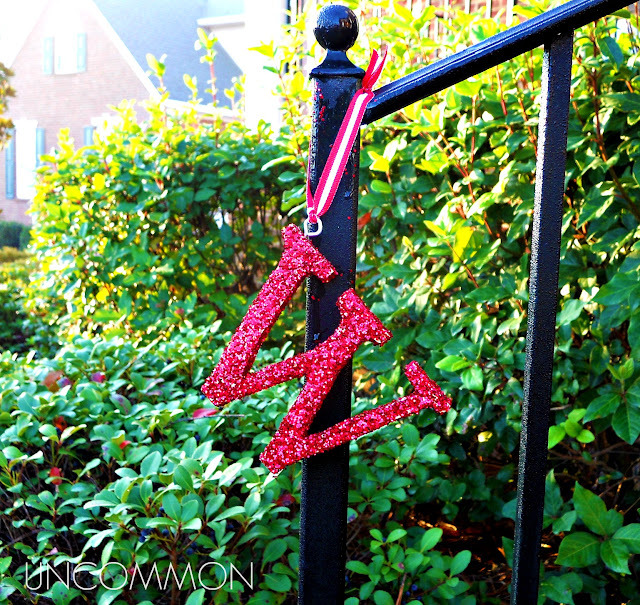 These are sturdy, well made monogrammed ornaments that anyone will love. Give them as an ornament, make your own for your tree, you can even use them to tie to the top of presents. Whatever you use them for, I promise you’ll have fun making them. Your kids will enjoy having the chance to do several parts of this ornament and they will be so proud! fun! This would be a great activity to do with my niece 🙂 Who doesn’t love glitter? I heart glitter letters so much right now – and I just got an awesome deal on a huge pack of glitter at Tuesday Morning! Coincidence? I think not! I love initial ornaments and mine is a W so I love ti even more:> Thanks so much for linking up and sharing at my Feature Friday Linky Party! Love those what a great idea! I love your Glitter letter. Loved the glittered monogramed ornaments you and your daughter made. such a fun project to do together. Thanks for sharing at Sunday’s Best and wishing you very happy holiday’s. Love this! Thanks for sharing on Overflowing with Creativity!! XO!